At 1:30:34 AM on Jun 17, 2017 the USS Fitzgerald and the container ship ACX Crystal came together just south of Yokosuka Japan. The ACX Crystal is a 730’ modern containership built in 2008 and capable of carrying 2,858 TEU of containers at a 23-knot service speed. The Fitzgerald is a $1.8B US Navy Arleigh Burke-Class Destroyer equipped with the Navy’s Aegis Ballistic Missile Defense System able to concurrently track hundreds of incoming targets up to 64 nautical miles away. Both are well-equipped ships that should be capable of avoiding others even in the very busy shipping and fishing area near Tokyo. But, even with all the modern navigational equipment, they did come together and lives were lost. The story behind that accident is educational for anyone involved with complex systems operated by human beings and it’s frightening for those that operate small boats at sea. It’s scary how quickly well-equipped and well-crewed ships can end up coming together. For those that go to sea, it’s a reminder to be vigilant, to use all means of tracking other ships, and to be early and conservative in the decisions made to avoid other traffic. For those that build complex systems with human operators, it underlines the importance of the human interface and helping operators, especially tired operators, find the signal in all the data. Just a bit more than 5 minutes (334 seconds) before the disaster, the ships were more than 3 miles apart. In the busy waters near Tokyo, many would consider 3 miles a comfortable distance, and in crowded waters it’s difficult to get more open water between boats. In these conditions some might even be tempted to get a coffee or check their email. It can start to feel normal. But, just 5 minutes later, 7 lives would be lost and a US Navy warship would take $367m in damage. At the time of the accident, it was the worst US naval accident in 4 decades and yet it went from near normal to disaster in only 5 minutes. As with all disasters, there wasn’t a single mistake that lead to the loss of lives and damaged equipment. Many mistakes combined over time and these mistake accumulate and accelerate up to the accident. Clearly the Fitzgerald was operating with some unfilled positions and the ship had far too many unfixed systems problems when it got underway. But, the crew was certainly of sufficient size to successfully make the trip. Even with some systems inoperative or operating at less than full capability, this accident could have been avoided. ProPublica recently published Fight the Ship: Death and valor on a warship doomed by its own Navy. It’s well researched and well written. They dig through 13,000 pages of naval reports to find the important facts and do an unusually good job of going through the details. The article focuses, as it should, on the serious problems from the top of the US Navy through the Navy 7th fleet leadership to the captain of the USS Fitzgerald. Many of the same issues contributed to another collision just two months later where another 7th Fleet Destroyer also home ported at Yokosuka Japan, the USS John McCain, lost 10 lives in another collision with a merchant ship. Clearly there were serious leadership problems and these issues were covered in detail in the article. Most make sense to me and all clearly need attention. Many of these issues were not fully within the control of the crew of the USS Fitzgerald so my focus in reading this article was more on those problems where they did have control and on the lessons that apply to all ships whether naval, commercial, or recreational. These are most relevant to me since I’m involved with both the design of complex systems that have human interfaces and also operate a small sea-going vessel. One important lesson is a simple but important one: look out the window. In this $1.8B warship, the crew is large and responsibility is broadly distributed, and it’s easy to forget that the best way to avoid hitting something is to look out the bridge windows. Normally naval ships will have watch standers on both the port and starboard side. In this case, due to personnel shortages, the captain had made a decision to not post separate watch standers. This is a very busy waterway with large numbers of fishing vessels and considerable commercial traffic. I’ve flown over it at night on the way to Tokyo and the entire waterway is ablaze at night with lights from ships. It’s a difficult area in which to operate safely and, at the time of the accident, 3 large commercial ships and around 2 dozen smaller ships were reported to be operating in the area of the USS Fitzgerald. It was a clear night and the nearby ships could be seen from the bridge of the Fitzgerald. It’s easy to get over-confident relying on RADARs and other navigational equipment. I’m a big believer in the utility of all this equipment, but none replace looking out the window. From experience operating a small boat at night, all shipping traffic looks closer in the dark and nothing encourages early and conservative navigational decisions more than seeing a large commercial ship only 3 miles away on a closing course. When operating a ship at 20 knots in a crowded seaway, it’s important to at least rely on visual watch-standing as one important source of anti-collision data. Nothing replaces visual watch-standing and, with a crew of over 300, this navigational safety role probably should have been prioritized higher. The marine Automatic Identification System is perhaps my favorite navigational information source after visually scanning the horizon and using RADAR. 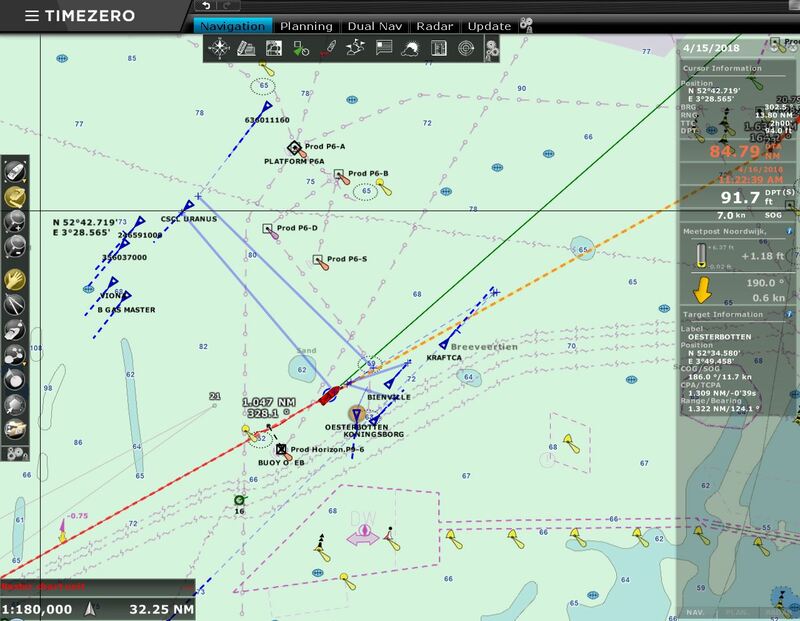 It’s a simple system where most commercial ships broadcast their position, speed, and other operational data on an internationally assigned VHF radio channel and this data is displayed on a chart overlay showing your ship’s position and that of all ships in the area. Better navigational systems show both the current ship’s position and the closest point of approach (CPA), calculated assuming the targets maintain course and speed. This is remarkably useful data and it alone can help avoid many collisions. The US Navy has a policy against its warships broadcasting AIS for security reasons but the naval crews still have access to the AIS data from other ships operating in their area. I argue that the USS Fitzgerald underway only 56 nautical miles from its home port would actually have increased its level of security by broadcasting AIS. Collision was, by far, their biggest security risk at that point in the mission. But it was against policy so they were not broadcasting and other ships had slightly less information to help them avoid a collision. 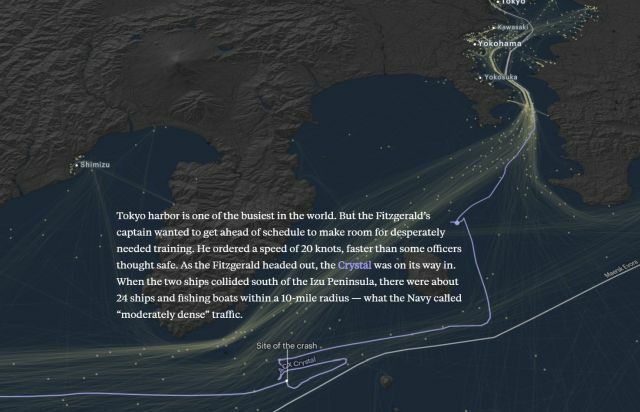 The crew of the Fitzgerald did have this data available to them however and, after visual and RADAR, AIS is potentially the most useful and easily used data to help avoid ship-to-ship contact. The Fitzgerald’s main mission is ballistic missile defense and one of their primary assets are large and very capable RADARs. The ship is very-well equipped. In this case, some RADARS were not working fully and the best-trained operators were not currently on board. They were operating both shorthanded and with some technical problems. Arguably their RADAR systems are designed for other types of threats quite different from “friendly” ships only 3 miles away. These complex RADAR systems in use on the Fitzgerald are not optimized for finding close-in commercial shipping and fishing traffic, but it would seem likely that even a less than fully skilled operator would have been aware of the presence of the 730’ steel containership only 3 miles away. However, I do know these RADAR systems can be difficult to use and small errors in settings can blind the crew to nearby targets. Back in 2016, when I was out on the USS California, a nuclear powered US Navy Attack Submarine off of Florida coast (USS California Distinguished Visitors Embark), I saw an innovative step to protecting against some of these RADAR technical and operator skill shortcomings. On the California they had installed a standard, commercially available RADAR that is only used when operating on the surface and near to friendly ports. This Virginia Class Submarine is one of the best equipped attack submarines in the world with some of the most advanced RADAR and sonar equipment available. And yet, for safe operation on the surface near ports, they augment their military systems with commercial RADAR similar to what we use on our boat Dirona. These RADARS are far easier to use than military RADARs, yet they work remarkably well and are quite reliable. Putting a commercial RADAR on the California augments their advanced weapons systems and potentially gives them more information when approaching a friendly port. Adding a good quality but inexpensive RADAR to all US Navy boats to augment their military grade systems when operating near to port would seem like a good safety decisions that could save lives and reduce equipment damage. A US Navy Captain is considered fully responsible for the safety of their ship no matter what. Whether the captain is on the bridge or not and, even if they are not on the ship at all, if the ship hits something, they will lose their job. If I was a Navy captain, I would be tempted to install a commercial RADAR even if I had to pay for it myself (and it would be crazy for the Navy not to install it themselves). There were many errors and poor decisions that led to this accident. Many were made at the most senior levels of the 7th fleet and the naval leaders above them, but some of the lessons apply to all ships operating at sea. Some of these on-ship lessons that stood out for me were: 1) Make sure that there is an adequate visual watch; 2) Assume the worst when nearing other vessels and take early and decisive action to avoid a collision. It’s remarkably how fast “normal” distance can become an unavoidable collision; 3) Use the RADAR. Naval RADARs do an excellent job of delivering weapons and avoiding close encounters with enemy ships, but they aren’t always excellent when operating in very close range and they are difficult to use. Adding a commercial RADAR as was done on the USS California seems like a prudent safety decision; and 4) AIS data should be used as a primary source of anti-collision data right up there with visual and RADAR. Given the risk of collision when operating near friendly ports, it probably makes sense for naval vessels to broadcast AIS data just as the commercial traffic does. This might allow a commercial crew to make better informed decisions when operating near naval vessels. Thanks to Frank Eigler for sending me this excellent article. If you are designing complex systems with human interfaces, there are many excellent lessons to learn from this article. And, if you operate sea-going boats, this article really drives home how quickly things can go wrong and the importance of constant vigilance and early and decisive action if there is a danger of collision. It’s also a reminder that even with a big investment in navigational equipment, there is no substitute to looking out the window and being cautious. Worth reading: Fight the Ship: Death and valor on a warship doomed by its Navy. The USN is not alone in colliding with the big commercial ship. November 8 Norwegian frigate Helge Ingstad had a collision with a loded Crude Oil Carrier just outside Bergen. Surcumstances seem to resemble the 2 USN frigates. Yes, there has been much discussion on the Helge Ingstad/Sola TS collision. I agree there are many similarities between these collisions. Thanks for the additional data on the Helge Ingstad/Sola TS collision. Notice the 3 coastal freighters northbound on the starboard side of Sola TS, limiting maneuvering options for Sola TS. One of them had to take evasive actions to avoid being hit by Sola TS and the warship. Bridge crew of this vessel, did not understand Norwegian, and was unaware of the collision. The 2nd southbound vessel, is a private motor yacht, also foreign. Pretty similar to a collission between a Norwegian warship and a supertanker outside Bergen, Norway, a few months ago. I read about the Helga Ingstad and Sola TS accident after an earlier poster, Jostein Lima, pointed it out. In that accident the Sola TS Pilot appeared to take early action to reduce risk by first contacting vessel traffic control (the crew of the Helga Ingstad will hear this) and later contacting the Helga Ingstad directly. The crew of the Naval vessel thought they were speaking with a boat further north and mistook the visual sighting of the Sola TS as a stationary object. I know it’s very easy to make mistakes in a crowded seaway with lots happening quickly but the Navy vessel didn’t appear to be using AIS their AIS data, it would have helped if they were broadcasting AIS, and it would have helped if both ships slowed down as the risk of collision increased. It is confirmed by the Navy that Helge Ingstad was using AIS receiver during the incident. Transmitter was off, as the general “rule” is in the Navy. It appears to be a total loss of situational awareness by the bridge crew of the warship, and partly also by VTS. All VHF communication was in Norwegian only, and far from “standard procedures.” This caused that the nearby ships in the area didn’t know a collision had occurred, until almost an hour later. The VHF communications, or at least parts of it, has been published by media. And it is shocking to hear to how bad it is. The final insident report must be released within one year after the collision. Will be interesting to read. That’s a good point that VTS should have been a safety net and all over the situation. It shouldn’t require VTS but they are the safety net and they should have been giving clear and unambiguous instructions to both ships. When I said the the Naval ship was “not using AIS” I didn’t mean they didn’t have it. Only that they weren’t using that data. It would have made it super clear the “stationary object” they thought they were avoiding was the in fact the Sola TS at speed. AIS would also identify the location of the boat they were talking to on the radio. RADAR and ARPA would have made it clear as well. Their GPS position on the chart would show the “stationary object” was likely another boat. Lots of mistakes appear to have been made but perhaps the best advice I get out of this incident is to be even more cautious as an operator because it really is easy to get confused especially at night, it’s easy to get stuck staring at one or two data points and not consult all the data available on the bridge, it’s definitely worth having more people on the bridge (and using them when fully) in close quarters, and to recognize that things do happen fast even on our boat. Jennifer and I try to both be available at the helm during close quarters operations especially at night and in close quarters. But, it’s still scary how quickly things can go bad. Like you, I’ll be looking forward to learning from the incident report on this one. Thanks for pointing it out. Thanks for the good read and info on this. Much appreciated. Here in Norway we had a somewhat similar accident to this when the frigate HNoMS Helge Ingstad collided with TS Sola this autumn. As far as I know the investigation is still ongoing and no conclusions nor lessons learned yet. However, the Norwegian Navy ship was not broadcasting AIS until after they were hit. Fortunately no lives were lost. Super interesting example — thanks for pointing it out. Reading the account excerpt below, the Pilot on the tanker bridge seems to have taken all reasonable precautions. If the Naval Frigate was consulting their AIS (in receive only), their confusion on believing the tanker was a stationary object would have been avoided. If they were transmitting AIS it would have allowed the pilot to contact them more quickly. At approximately 03:57 the pilot observed the echo of a southbound vessel on the radar, which would cross his course line, but did not have an AIS signal for the vessel. The pilot called Fedje VTS and asked for the name of the vessel that was heading towards the tanker on the port bow. The VTS answered that they had no information about this vessel. The pilot and captain on Sola TS then tried to contact the vessel in other ways. They flashed the Aldis lamp, and the pilot requested a 10-degree course change to 000° from the captain on Sola TS. Once Fedje VTS informed Sola TS that the vessel was possibly KNM Helge Ingstad, the pilot called the frigate and requested it to turn to starboard immediately. The frigate’s bridge crew replied that they could not turn to starboard before they had passed the object they saw on their starboard side. Just after 04:00, the frigate was approximately 400 m from Sola TS. As the naval vessel did not change course, both the pilot and Fedje VTS called it requesting the vessel to act. Shortly thereafter, KNM Helge Ingstad carried out an avoidance manoeuvre, but it was too late, and the two vessels collided. As a retired Naval Officer with many years at sea standing bridge and CIC watches I have followed the Fitzgerald saga closely. The comments regarding a comercial short range radar struck home. In 1962 I was onboard a newly commisioned DLG which had a small commericial radar onboard that had been procured by the Supple Officer at the CO’s direction. It was great and could pickup buoys at 100 yards when we had nothing but sea clutter on the surface search radar. When we had a In Service Survey Inspection (INSERV) we had to remove it because it was not on the Coordination Onboard Shipboard Allowance List (COSAL). Hopefully the sub skipper didn’t suffer the same fate and the Navy has learned something since I retired. I understand why the Navy might be reluctant to have COs install arbitrary electrical gear. That makes sense. I think the navy should test some commercial RADAR and then authorize the crew to use it as an additional data point when in close quarters in non-stealth situations. The same situations where turning on AIS broadcasting would make sense as well. Thanks for passing along your experience. They took the transmitter head on the Furano and made a custom display for use for navigation. It seems to me that at least one angle on this story is how poorly the Navy bungled the acquisition and maintenance of this RADAR set if it really performed as poorly as the sailors seemed to behave.